If we can have a blockbuster musical about Alexander Hamilton — or Sweeney Todd, for that matter — why not about Johannes Gutenberg? Because, back in the ‘90s, Anthony King and Scott Brown, the creators of “Gutenberg! The Musical!” thought it was “the most intentionally terrible subject” they could conjure for a musical. Not only because it’s about the invention of the printing press in the 15th Century (a development that did, in fact, change the world), but because there’s so little actually known about the details of Gutenberg’s life (although a lot more information is available than they let on from their reported Google search). So, a tuner that started as a prank, inspired by some actual bad musicals, a couple of songs whipped up by two North Carolina natives, friends since junior high, ultimately lay fallow for years. 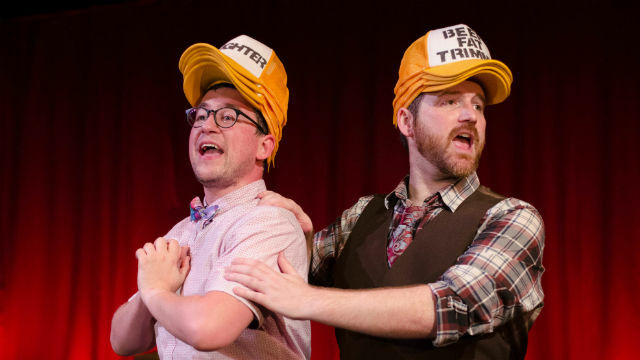 Then they resurrected it in 2003 and expanded it into a 45-minute show, which ran for almost two years at Upright Citizens Brigade Theatre in New York (King served as the company’s artistic director from 2005-2011). For a London run in early 2006, they lengthened it yet again, to a full-length musical that went on to have a six-month stint Off Broadway that same year. In 2007, it was nominated for a Lucille Lortel Award for Outstanding Musical, an Outer Critics Circle Award for Outstanding New Off-Broadway Musical and a Drama Desk Award for Outstanding Book of a Musical. This was about the same time “[title of show]” premiered; must’ve been a great year for small, self-referential musicals. The show exploits every imaginable musical theater trope, genre, song type and cliché. But this clueless, marginally talented, naïve duo thinks that all it needs is the money to get it to Broadway. Now, we (possible Broadway producers among us) are witnessing their backer’s audition. And, as often happens at these events, the writers sing all the songs and play all the roles — including, in this case, a Dead Baby and an Anti-Semite (no one said it was gonna be in good taste). The anti-Semitic flower girl was added because the play is set in small-town Germany, and mentioning the Holocaust, however inappropriate, gives the story some weight and gravitas. The writers also invented an evil Monk, who destroys the printing press because he’s hellbent on keeping the public illiterate. The many characters are differentiated by yellow baseball caps that sport their identity: Rat, Drunk 1, Drunk 2, and Helvetica – Gutenberg’s imagined girlfriend – among them. One might inquire: To whom will this antic insanity appeal? Theater mavens who know everything there is to know about musicals, and find in-jokes and meta-structure orgasmic. And, antithetically, those who know nothing about theater and will be delighted to learn the definitions of ballad, metaphor, charm song and the like. There is definitely some clever writing. It’s a terrific showcase for two strong singers with expert comic timing (though it’s a bit less fun to watch them sweat). Tom Zohar and Anthony Methvin (a real-life couple) are very talented and play off each other very well. Their respective tenor/bari voices meld perfectly and they’re excellent in contrapuntal numbers. The hat-changing (and the clothesline of hats as chorus kickline) can be pretty funny. Plus, there’s an unsympathetic pianist (musical director Lyndon Pugeda) who accompanies them, when he’s not taking selfies. Backyard Renaissance Theatre Company brought in director Kim Strassburger, who keeps the players in almost constant motion (their non-acting time is spent rearranging hats). But somehow, it all doesn’t come together. It feels forced and precious, and more silly than smart. Not my particular cup of comedy. But maybe it’s yours. Performances are Thursday-Saturday at 8 p.m., Sunday at 2 p.m. and 7 p.m.